At a Coles supermarket in Perth, avocado lovers found the expensive fruit available for an astonishing ten cents. A picture appeared on Twitter on Tuesday, with the caption: 'At a Coles in Perth'. 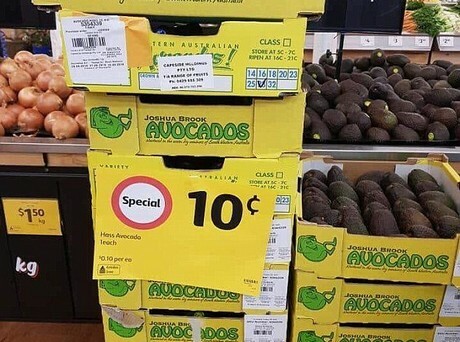 The image shows numerous boxes of Hass avocados slashed to ten cents per avocado on 'special'. They were marked down at Wanneroo Coles, Perth, after the supermarket ordered too many avocados. The popular fruit has long been blamed for Australia's housing crisis as millennials opt to enjoy the luxury of smashed avo and feta on toast, instead of saving for property. Social media users were quick to respond to the unlikely finding, hoping they would be able to catch the bargain. Chief executive officer of Avocados Australia, John Tyas, said that there are lots of new plantings around the country. 'There are other regions with higher crops this year as well but we see a particularly bigger crop for Queensland,' he said in an interview. Mr Tyas said that they were sure the new tree plantings would boost production and supply in the coming years. 'We expect production to be over 110,000 tons by 2025,' he said.